It’s a common misconception that tree maintenance cannot be done during the winter months, or that tree care companies don’t operate during this time of the year. The reality is that winter is a good time for pruning and tree removal services. In fact, some major pruning work should only be done during the winter, such as pruning fruit trees to maximize fruit production. 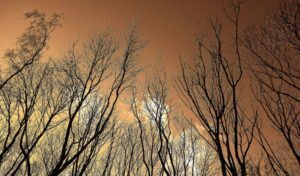 During winter, trees and shrubs enter a state called dormancy. Leaves fall off deciduous plants and trees take a “rest” until warmer spring temperatures prod them into putting on a new flush of growth. Pruning during dormancy (called “dormant pruning”) has several benefits, both for your trees and for you. After the leaves have dropped in fall, it’s easier to see the structure of your trees and, for a trained arborist, it’s easier to identify dead or dangerous branches. This lets us determine whether or not pruning is needed to keep your trees safe and looking their best. Late winter is a great time to prune, contain or rejuvenate overgrown shrubs and trees as they’ll be able to recover quickly in spring with new growth. This will also minimize the amount of time you’ll spend looking at a plant that looks like a bunch of sticks after rejuvenation pruning. Winter pruning can also avoid spreading some serious diseases that are active and spread easily during the spring and summer growing seasons, such as Dutch elm disease, oak wilt, cedar hawthorn rust and fire blight. During winter, the bacteria, fungi, parasites and insects that cause and/or spread disease are either dead or dormant, so diseases are less likely to be transmitted by pruning. Here in Northeast Ohio, the ground often freezes in winter so we can bring in heavy equipment without damaging your landscape, resulting in lower costs, faster work and better outcomes. This is especially true for large pruning jobs and tree removals. Winter pruning doesn’t stimulate new growth that can be killed by cold weather, damaging and disfiguring the tree (this is why fall pruning isn’t generally a good idea). Plus, research shows that pruning before buds break in spring leads to “optimum wound closure”, letting trees heal from pruning cuts before warmer weather brings out destructive insects and pathogens. Damaged, dead or dying trees can be dangerous in winter, particularly when we get significant amounts of ice or snow. Dormant pruning makes them safer and can also rejuvenate weaker trees by removing dead and diseased wood. Dormant pruning will remove the flower buds on early spring-blooming plants. If you want to see the tree or shrub bloom in early spring, it’s best to delay pruning until just after it’s finished flowering. What About Spring & Summer Pruning? Many of these pruning activities are done during the growing season because the issues often are not obvious until the trees have leafed out. Speak with one of our arborists about a customized pruning plan based on the current needs of your property. Over the long term, proper pruning can help promote the health of your trees.